Let's face it. 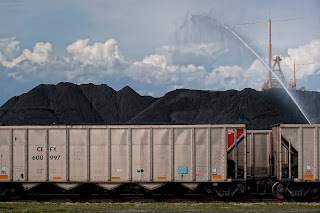 The impacts of 18 one-and-a-half mile long coal trains rumbling past our houses, parks and schools will be severe. Not only will these trains block vehicle access to the waterfront, clog downtown streets, and reduce property values, but unless we are diligent, taxpayers could be on the hook for 95 percent of the cost of necessary railroad upgrades, such as overpasses and new sidings. Add that to the increased risk of cancer, asthma and respiratory illness and it just doesn't add up. So how do we stop a coal train? We stop a coal terminal. And the way we do that is by participating in the regulatory process. Unglamorous? Yes. But the best weapon in the fight to defend our community is our collective voice. From now until Jan. 21 regulators are asking citizens to comment on the scope and content of the environmental impact assessment for the Gateway Pacific Terminal. Before they study the effects of siting North America's largest coal export facility in our backyard, they're asking you, "What environmental, economic and social impacts should be considered?" Vessels: At full build-out, 487 Cape- and Panamax-sized ships would visit Gateway Pacific Terminal every year. Combine these with the additional ships proposed to serve new terminals for tar sands oil and LNG exports and the risk of a catastrophic oil spill goes through the roof. To properly evaluate the risks vessels pose, we are asking regulators to assess cumulative impacts of all current and proposed vessels that will travel through the Salish Sea and Unimak Pass-the gateway to valuable Bristol Bay fisheries and one of the world's dangerous waterways. Herring: Cherry Point is home to a unique species of herring that spawns in the spring, perfectly timed with the migration of spring Chinook. No herring equals no Chinook. RE Sources asks for a full assessment of impacts from the pier, ships and coal dust on this keystone species. Runoff: When it rains, how will the terminal operators keep toxics from 80 acres of coal heaps from seeping into groundwater or running off into the nearshore environment? How much mercury and PAH chemicals will this stormwater contain? What are the long-lasting impacts of these toxics? Wetlands: If built, Gateway Pacific Terminal would destroy 141 acres of wetlands and degrade another 21 acres. The Environmental Impact Statement must address how to protect water quality at Cherry Point. Remember, they want to pile 48 million tons of coal per year on what is now a highly-functioning wetland system. Coal dust: Regardless of what project proponents tell us, Gateway Pacific Terminal will have a dust problem. Eighty acres of coal heaps near the shore will regularly be moved and rotated, because otherwise, they may start on fire - the kind of coal that this terminal plans to export is prone to spontaneous combustion. At nearby Westshore Terminal an estimated 700 tons of coal dust per year blows onto the surrounding farm fields, shorelines and community. We need to understand coal dust impacts on agriculture, beaches, fish and birds. While we at RE Sources prepare our scoping comments, I urge you to do the same. Think about how the proposed project, vessels, and associated trains will impact you, your family and your livelihood. Ask that these impacts be studied and measured. Consider the significance of those impacts, the costs, and who will bear those costs. Write (or speak) from the heart and have your voice heard. More information on the process and how to write a scoping comment can be found at eisgatewaypacificwa.gov. Crina Hoyer is the executive director of RE Sources for Sustainable Communities. RE Sources is a non-profit environmental organization working to protect our local waterways from the potential impacts of the proposed coal port. Other programs include the North Sound Baykeeper, Sustainable Schools, The Sustainable Living Center and The RE Store. Go to re-sources.org for more information.